Cate Masters: Let the hunt begin! 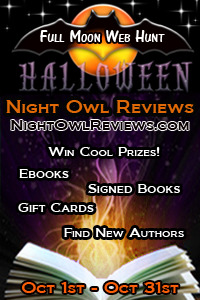 The Night Owl Reviews Full Moon Halloween Scavenger Hunt, that is. Starting today, it runs through October. The NOR ad will be up all month so you'll have the link whenever you need it. You can win all sorts of goodies! Including a print copy of One Soul for Sale. Three are up for grabs. If you missed the Casting Call and Story Elements posts for One Soul for Sale, you should check them out to learn more about this novella.